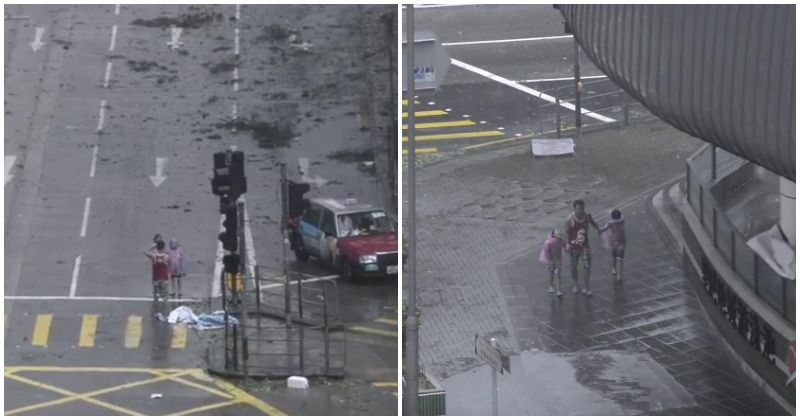 As a deadly typhoon raged in Hong Kong, a father was seen ordering his children to pose for a photograph, that soon went viral highlighting his irresponsible conduct. Taken in Hong Kong as tropical storm Mangkhut brought life to a standstill in the populous southeastern China city, the photo piqued the curiosity of millions around the world. Mangkhut made landfall in the Philippine province of Cagayan on September 15 and subsequently impacted both, Hong Kong and southern China. Wind speeds have clocked at over 285 km/h, with the gusts said to have reached around 225 km/h at the time the dad asked the two small kids to stop and pose. In a video captured by 44-year-old Joseph Anthony, the rains can be seen slamming down in the city. The camera then pans to the dad and two kids, who are in the middle of a road in the Kennedy Town area of Hong Kong. With citizens advised against leaving their homes, the sight was quite unusual, especially considering that the man was wearing nothing but a sleeveless vest and the two kids sporting flimsy raincoats. After the photo is taken, the dad takes his two children by their hands and begins leading them away. The camera follows them as they walk across the Kennedy Town Swimming Pool Complex, with both kids struggling to keep their jackets on against the wind. They then suddenly stop, turn back around and walk the other direction as the rain continues to pour and the video closes out. Speaking about the admittedly bizarre incident, Anthony said, "I was surprised to see the dad out with his kids that early on. I noticed he stopped to take photos of them in the middle of the road as that's what caught my eye to capture some footage." As of September 16, at least 69 fatalities have been attributed to Mangkhut, including 64 in the Philippines, four in mainland China, and 1 in Taiwan. Hong Kong issued a Hurricane Signal No. 10, which is the highest level of tropical cyclone warning signals in Hong Kong, for 10 hours, marking only the third such occasion that the warning had been issued in the region since 1999. Mangkhut is the strongest typhoon to strike Hong Kong since Typhoon Ellen in 1983 and has caused flooding in many of the region's low-lying and coastal areas. It has also caused trees to be knocked over and resulted in many high-rises swaying due to the wind speeds. While no fatalities have been reported yet, more than 200 people are said to have been injured. According to the Home Affairs, a further 1,219 people have sought refuge in emergency shelters. Due to the substantial damage caused, the Education Bureau announced that all schools would be closed on September 17 and on September 18.